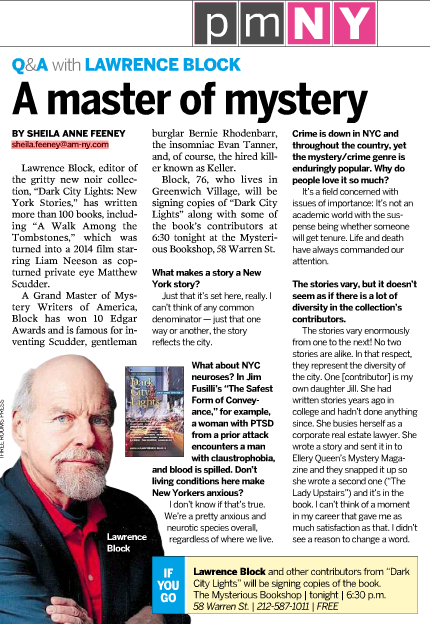 Master mystery author Lawrence Block, best know for his Matthew Scudder series (8 Million Ways to Die, A Walk Among the Tombstones), was interviewed by AM New New York in support of DARK CITY LIGHTS: NEW YORK STORIES, the just-released Three Rooms Press anthology he edited. He discusses what makes a “New York Story,” if New York neuroses cause New Yorkers to be too anxious, and the diversity of stories in the “gritty new noir collection.” Find the complete interview here. Block joins 18 contributors to DARK CITY LIGHTS at the official NYC launch tonight at The Mysterious Bookstore, 58 Warren Street in Tribeca.